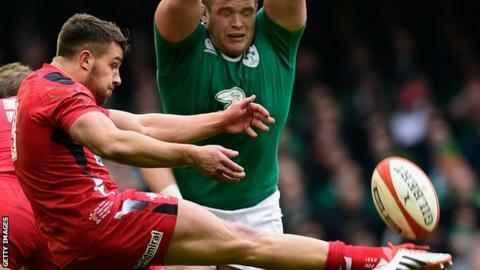 Wales scrum-half Rhys Webb is set to miss the Six Nations with the injury that ended his Rugby World Cup hopes. The Osprey, 26, has undergone surgery on the foot he injured in Wales' final warm-up game with Italy in Cardiff. Wales full-back Leigh Halfpenny is also unlikely to play in the Six Nations after his knee injury in the same game. "At this stage, Rhys is looking at a six to eight month period out of action," said Ospreys medical performance manager Chris Towers. "Rhys sustained a significant foot ligament injury that required surgical stabilisation. "He has had the surgery and will be non-weight bearing for six weeks and will then wear a protective boot for a further four to six weeks. "Only after that will we be in a position to progress his rehab." Webb left the field at the Millennium Stadium on a stretcher during the first half against Italy after his leg was caught in a ruck.